GUELPH, ON (July 7, 2014) – Grain Farmers of Ontario is extremely disappointed to have read yesterday’s media statement that Ontario’s newly appointed Minister of Agriculture intends to make this province the first in Canada to restrict the use of neonicotinoid pesticides. The Ontario grain industry has committed extensive resources over the past two years to mitigate the risk to bees. Many of these initiatives have been launched and put into practice this growing season and the results of ongoing research projects and in-field practices will be paramount in determining any future regulatory decisions. It is counterintuitive to implement a regulatory change without the completion of this research and trials. The move Minister Leal is proposing is a move against Canada’s science based regulatory system. Ironically, on July 3rd, Minister Leal sent a letter to Grain Farmers of Ontario for publication in the Ontario Grain Farmer magazine stating “we must continue to ensure decisions are balanced and based in science”. Naturally, the organization is confused by these contradictory messages, only days apart. Further, farmers across the province are shocked by the manner this announcement was made. Grain farmers have demonstrated their cooperation with government on this issue since 2012 and have had a positive working relationship with those involved in the bee health file. 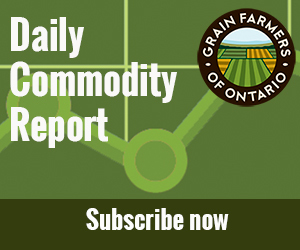 Grain Farmers of Ontario is extremely disappointed that Minister Leal did not take the time to consult the organization as there will be negative financial impact to Ontario’s corn and soybean farmers and the grain industry as a whole. Grain Farmers of Ontario has always had a good working relationship with the Minister of Agriculture and we hope that this continues in the future. This is not a good start — our organization believes in an open and collaborative approach and we encourage this government to work cooperatively with us as we move forward.